pretty penny, according to a federal report: about $874 million, with the government losing about $187 million. 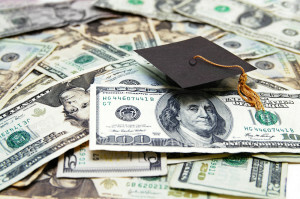 A Michigan man’s identity was used to secure $3,000 in student loans and a $6,700 Pell Grant. The victim filed a police report, a complaint with the Federal Trade Commission, and disputes with all three major credit bureaus—to no avail. The government said that since his information was used, he was still responsible for loan payments. Both victims mentioned their situation to their respective insurance agents, who said their insurance policies covered them for Identity Management Services from IDentity Theft 911. Now, they each have their own dedicated fraud specialist helping to resolve their cases. Student loan fraud happens when identity thieves apply for loans using stolen personal information, often through low-cost online colleges. They receive federal funding through the school, and after tuition and fees are deducted, the balances is remanded to the “student.” Criminals usually take that balance and leave victims on the hook for debt repayment. Identity theft rings are often behind this crime. However, a report by the Office of the Inspector General shows an 82 percent increase in the number of college students who are suspected of engaging in loan fraud in the last four years. Suspected participants jumped from 18,719 students to 34,007 in that period. The office identified more than 85,000 recipients who might have participated in student aid fraud rings. If you suspect you’re a victim of identity theft or wish to proactively manage your identity, check with your insurance company, financial institution, or employee benefits provider. Many companies offer LifeStages™ Identity Management Services from IDentity Theft 911 for low or no cost. To learn more, visit idt911.com or call 1-888-682-5911.